Well over eight million patents are held worldwide by many thousands of businesses, but only a small percentage of these businesses truly understand what they are paying to keep their patents in force. The vast majority – especially those without in-house IP expertise – are kept in the dark when it comes to the hugely inflated fees they end up paying every year to make patent renewals. As patents are granted and maintained on a country-by-country basis, most patent holder’s employ a third party to deal with the complexities of managing renewals across multiple regions. Depending on your attorney, you will either receive an invoice for your renewal fees directly from them, or from the third-party tasked with renewing your patents, companies such as CPA Global. If your renewals are outsourced, as most are, it is likely that you will be paying a number of hidden costs. Many of these companies quote a single fee for each renewal, but then bury hidden charges into inflated foreign exchange rates. For instance, to make a United States Large Entity 3rd renewal with one of the market leading international renewals company we were quoted a patent office fee of $7,400, which at the time of the quote and exchange rate, translated as £6,585. 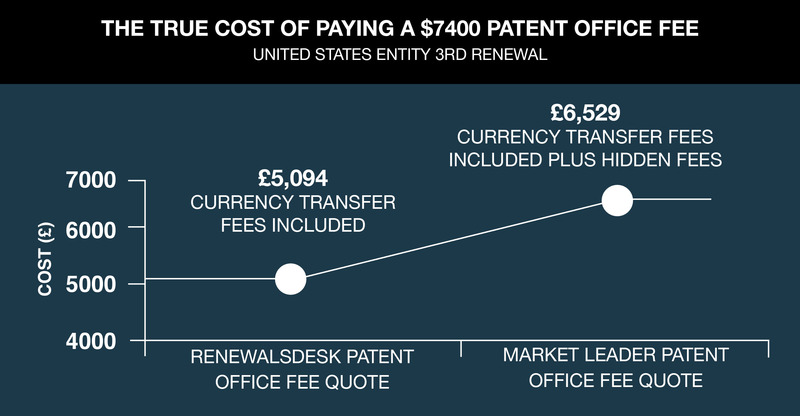 But the ACTUAL patent office fee is only £5,094, meaning that the company in question has charged its client £1,490.00 somewhere in this exchange process. We launched RenewalsDesk to both expose the various fees that are buried in aspects of the patent renewal process and also to empower patent holders to manage their renewals in automated manner and save time and money in the process. A total cost to the patent holder of £5,269, which is £1,316 less than that of the competitor company. The company in question justifies these fees in a number of ways. Firstly they, like any non-banking institution, are unable to transact at the exact current exchange rate and have to pay a mark-up for exchange. The extra charge is also justified (if you take the time to ask) to cover any fluctuations in exchange rates that make take place between the invoicing date and the date of the actual patent office payment. But, this cost is well above any realistic currency fluctuations and none of this money is returned to the patent holder once the renewals process is complete. On top of this the company in question charges around £50.00 to renew less than 25 patents and an array of other extras in some cases. A recent study by the WIPO found that the UK were close to the bottom when it came to the average length of time that people held onto their patents for, just 7.6 compared to Germany (11.3 years) South Africa (11.1 years) and India (11 years). With renewals fees being so heavily inflated is it any wonder? We would like to appeal to both individual patent holders and attorneys that currently outsource their clients patent renewals to get in touch with us to see how we can drive down the cost of patent renewals.